This week on Open Sources Guelph, we enjoy the last few hours of the Obama era, which we may recognize in the years to come as the Age of Reason. Well, we have reason to be concerned, as do the thousands of people making their way to Washington this weekend to protest the incoming president and we’ve got one of them on the show. We’ll also talk about the problems with our own country’s leader, the problems with trying to lead another country out of a lucrative alliance, and we’ll mark the end of one of the worst abuses of judiciary power of the last 10 years. 1) More Cowbell! 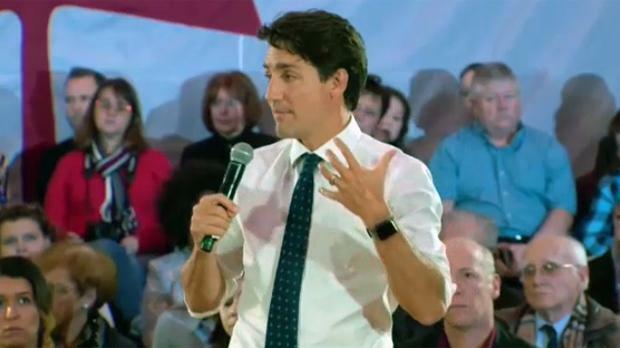 Apparently, the “Cowbell Tour” is how PMO staff have privately referred to Justin Trudeau’s travels to every church basement and Tim Hortons from here to the Atlantic Ocean as the prime minister’s listening tour rolls on. Things have not always gone as planned. One woman was upset about electricity, a student in Quebec pulled a bait and switch with a selfie, and now Trudeau’s got some ethics trouble from an ill-advised helicopter ride. We’ll check in with Trudeau’s totally awesome cross-country meeting series and talk about whether or not it was the sunny way to buy more sunny days. 2) Brexit Plan. Meanwhile in Britain, United Kingdom Prime Minister Teresa May finally outlined the plan that will take the U.K. out of the European Union, and from the sounds of it, she wants all the benefits of EU membership, but without any or that being an actual part of the club nonsense. May’s looking for free trade, the continued free flow of people and information, but the real question is how is the E.U. itself going to react? Entering it’s first divorce, will the remaining union members play hardball and teach Britain a lesson, or will they back-pedal in order to keep them close to the fold? We’ll look at the drama so far. 3) This Is the End. This weekend, hundreds of thousands will gather in Washington. They’re not there to celebrate the new president, but to protest him. From D.C. to New York to Toronto and now onto Guelph, perhaps millions of people across the continent will mark the beginning of the presidency of Donald Trump with a protest against him. We’ll talk to Courage, a Native American protestor that is taking a break from fighting for the environment at Standing Rock to make sure that the incoming president knows exactly what the majority of people think of him. Given that he’s indigenous and two-spirited, he’s probably got some things to say about Trump. 4) Free Manning. In one his last acts as president, Barack Obama granted clemency to Chelsea Manning, the former armed forces officer who allegedly leaked classified information to Wikileaks showing American troops basically committing war crimes in Iraq. They didn’t just throw the book at Manning, they threw a library, and she was given a massive 45-year sentence, which is far more draconian than other sentence for similar crimes. What is the message that Obama was trying to send by pardoning Manning? Was it sympathy? Was it guilt? Or is Obama trying to set a tone for the new president about the realities of a free press and whistleblowers?